Apple iTunes streaming tipped for iOS update in March 2015 | What Hi-Fi? It's now been the best part of a month since we first reported that Apple was looking at using the Beats Music service to enter the music streaming market to take on the likes of Spotify. New reports have now emerged about how that might happen – and it seems the Cupertino giant has an ace up at its sleeve that will give its streaming music service a helping hand. According to the Financial Times, Apple is to bring Beats Music into the iOS operating system via an iOS software update, a move that will see the service instantly land on millions of iPads and iPhones. 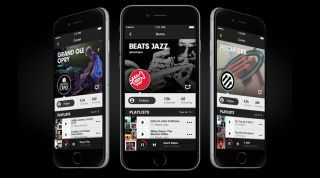 It's likely that the existing Beats Music streaming service will be re-branded and brought under the iTunes umbrella to create an Apple iTunes streaming music service. If Apple can avoid the musical backlash that greeted it after U2's latest LP landed unannounced on iOS devices, the move should prove an effective way to take on the market-leading streaming service, Spotify. And with the music subscription service expected to grow even more in 2015 now that YouTube has entered the arena with the launch of YouTube Music Key, Apple will need to make its presence felt in order to grow its user base, and having failed to gain much traction in the US with iTunes Radio. With Apple now playing catch-up in the streaming market, it's claimed that the iTunes streaming service could touch down on an iPhone or iPad near you as early as March 2015. We await with great interest.